DENVER, CO--(Marketwire - May 14, 2008) - Gold Resource Corporation (GRC) (OTCBB: GORO) (FRANKFURT: GIH) reports its highest gold intercept to date at its La Arista deposit with 1.3 meters of 142.5 g/t gold, 800 g/t silver, 0.45% copper, 0.21% lead, 0.55% zinc, (or a gold equivalent* value of 162.08 g/t (5.21 oz/tonne)). La Arista is part of GRC's El Aguila Project in the southern state of Oaxaca, Mexico, which is targeting gold production in 2008, subject to timely obtaining the remaining required permits, regulatory approvals and equipment delivery schedules. Gold Resource Corporation's President William W. Reid stated, "Since the discovery of the La Arista deposit, our drilling has focused specifically on delineating this area. Detailed exploration shows we are dealing with two primary, high-grade veins, one that we will now refer to as the La Arista vein (previously referred to as the La Arista vein #1) and the Baja vein (previously referred to as La Arista vein #2). This focused exploration has rewarded us with our recent highest grade gold intercept of 1.3 meters of 142.5 g/t gold within 4.6 meters of 42.1 g/t gold and previously, for intercepts of at least 1 meter, with our highest grade silver intercept, 1 meter of 5,000 g/t silver within 4 meters of 2955 g/t silver (press release dated Dec. 10, 2007), both intercepts of which are in the Baja vein." The La Arista vein and the Baja vein, which appear to be only 30 meters apart, have now been mapped on the surface over a strike length of approximately 600 meters (see map). Each has been drilled over strike lengths of only 250 meters so the mineralization for each vein is still open in strike and with depth. Drilling has shown the mineralogical character of each vein to be somewhat different, with the La Arista vein precious metal values equaling approximately 60% of the total value, with the base metals equaling 40%. 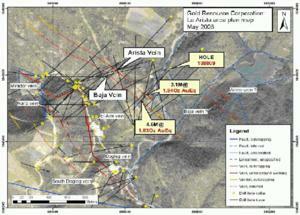 The Baja vein, on the other hand, shows precious metal values of 80% to 90%, with the base metal values of only 10% to 20%. William W. Reid stated, "It is important we stay focused on defining the La Arista high-grade vein system. Our immediate goal is to delineate this mineralization in detail, targeting holes on a 50 meter grid both horizontally and vertically, so we can begin to plan and design for an underground mine. We want to be in the position to begin development of the underground mine, or more specifically to begin driving the decline ramp, as soon as we begin production and cash flow from the El Aguila Project's high-grade open pit deposit. This will allow the underground development at La Arista to be paid for through cash flow and give 12 months of development time prior to commencement of processing the La Arista deposit high-grade polymetallic ore in the second year of operations. Once we have enough drilling into the La Arista deposit to design the underground mine, we will then turn our attention to the many additional exciting targets both in this immediate area and throughout the El Aguila Project. We continue to be impressed with what we believe is a very large, robust and high-grade epithermal system." Gold Resource Corporation is a mining company focused on production and pursuing development of gold and silver projects that feature low operating costs and produce high returns on capital. The Company has 100% interest in four potential high-grade gold and silver properties in Mexico's southern state of Oaxaca. The company has 34,206,952 shares outstanding and no warrants. For more information, please visit GRC's website, located at www.Goldresourcecorp.com and read the Company's 10-K for an understanding of the risk factors involved. This press release contains forward-looking statements that involve risks and uncertainties. The statements contained in this press release that are not purely historical are forward-looking statements within the meaning of Section 27A of the Securities Act and Section 21E of the Exchange Act. When used in this press release, the words "plan," "target," "anticipate," "believe," "estimate," "intend" and "expect" and similar expressions are intended to identify such forward-looking statements. Such forward-looking statements include, without limitation, the statements regarding Gold Resource Corporation's strategy, future plans for production, future expenses and costs, future liquidity and capital resources, and estimates of mineralized material. All forward-looking statements in this press release are based upon information available to Gold Resource Corporation on the date of this press release, and the company assumes no obligation to update any such forward-looking statements. Forward-looking statements involve a number of risks and uncertainties, and there can be no assurance that such statements will prove to be accurate. The Company's actual results could differ materially from those discussed in this press release. In particular, there can be no assurance that commercial production at the El Aguila Project will be achieved in the time frames estimated, at the rates and costs estimated, or even at all. Factors that could cause or contribute to such differences include, but are not limited to, those discussed in the company's 10-K and Form SB-2 filed with the Securities and Exchange Commission.